This blog post was first published on Best of the Northwest on April 25, 2018. Looking forward to a forecast of rain this weekend, I had to get out and enjoy the sunshine yesterday! You can’t take 80° weather in April for granted. So I sprayed my son down in sunscreen and told him we were going on an adventure that would take us over bridges, thru tunnels, to a castle and some waterfalls. We drove over a bridge and thru a tunnel to get onto I-84 in Portland, and then began journeying East to the Historic Columbia River Highway. We got on the Hwy in Corbett and drove the winding roads to Crown Point Vista House – aka ‘the castle’. The views were stunning. The sunshine was warm. But the WIND was insanity! Vista House was actually closed – due to ‘weather’. What I didn’t know before going was that Vista House closes when winds exceed 50 mph – and yesterday the gusts were recorded at 55! So I held on tight to my son’s hand, so as not to lose him. 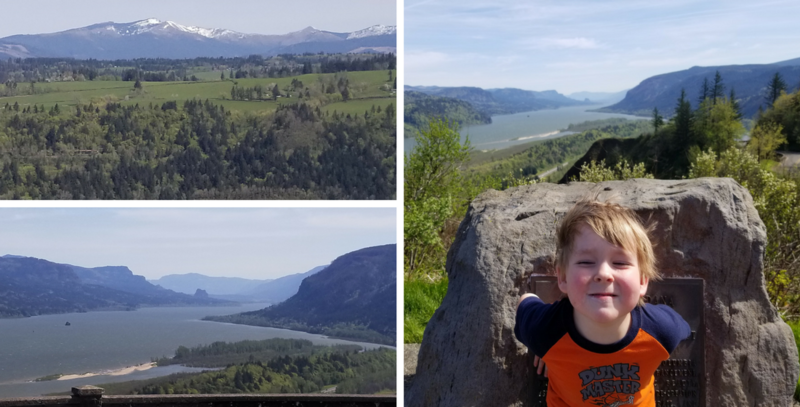 He still wanted to look around and see the views of Washington’s hills and the Columbia River, so we walked a little ways. We continued our winding drive to the waterfalls, and began pointing out all the colors of wildflowers we could see growing on the hillside. I first saw white and blue flowers, and then my son began pointing out the yellow, purple and pink flowers. By the time we parked at Latourell, he pronounced that he’d seen all the wildflowers in the world! But on our walk up to look at the falls, we stopped and got a closer look at a few of those beautiful wildflowers. Next we wanted to visit the biggest falls – Multnomah. But I should have done my research – yes, Multnomah Falls is open, but no, the Historic Columbia River Highway is closed to the east and west of Multnomah Falls. Unfortunately, after Bridal Veil, I was rerouted onto I-84 West. So I drove a few miles until I could turn around, and start heading back the right way. Multnomah Falls is only accessible by the I-84 parking lot. 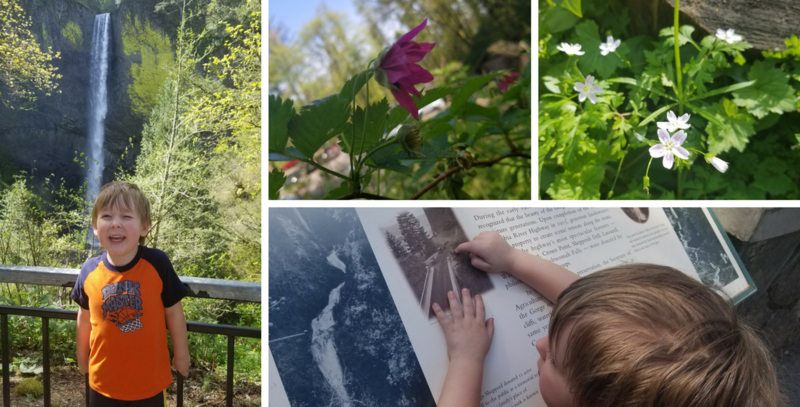 Of course, this made the adventure even more fun for my son, who got to see the ‘castle’ from below, as well as walk under tunnel #2 (to get from the I-84 Lot to Multnomah Falls), alongside a lovely creek that I could tell he was seriously considering jumping in. We walked up to the viewing platform in front of Multnomah Falls, and the windy conditions had the spray from the falls traveling quite a distance. You still can’t walk up to the bridge – the trails and upper viewing platform are still closed while they continue recovery efforts from the Eagle Creek Fire. But the coffee and fudge shop is still open, as is the visitor’s center, gift shop and lodge. We did make a short visit to the gift shop. I was in desperate need of a hat, due to the windy conditions. Turns out, my son was in desperate need of a new fire truck toy. Then we stopped at the coffee shop, because my son informed me he was also in desperate need of a banana nut muffin. So we both found what we needed. Despite my missteps in planning, my son and I had a great adventure. He’ll be telling the story for days. Take advantage of the great weather when it’s here! 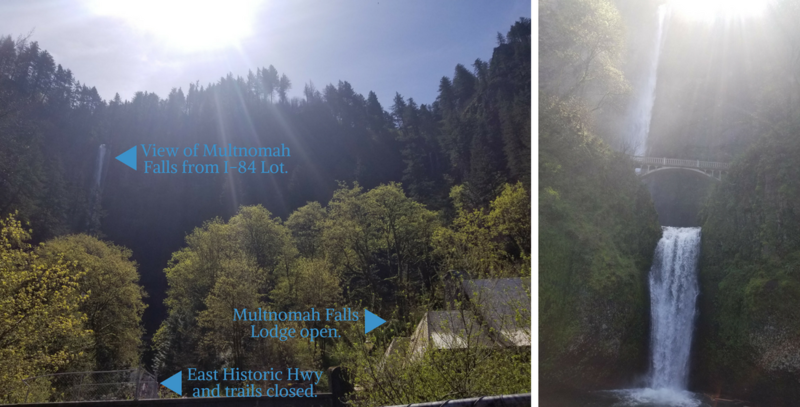 Many cruisers have been concerned about whether Multnomah Falls is open after the horrific Eagle Creek Fire last year. It is open! You can still visit the beautiful waterfall, and visit the gift shop for your Multnomah Falls souvenirs – as well as donate to recovery efforts. But the entire waterfall region is not open, and the trails and upper platform are not currently open. As recovery continues, more will continue to open up. But if you’ve booked your Spring Columbia River cruise, you can still visit Multnomah Falls!